When asked to list objects made of glass, the first items we often think of are wine glasses, windows, mirrors or spectacles. However, glass has led to the creation of some of the greatest scientific inventions in history. Scientific glassblowers work directly with engineers, chemists and scientists to create everything from solar panels, microscopes and CAT scan machines. In order to craft a diversity of shapes, glassblowers must learn to work with the spontaneous material. According to scientists, glass is an amorphous solid — a mesh of disordered atomic bonds that contrasts the uniform lattice structure of crystals and the free-floating molecules of liquids. 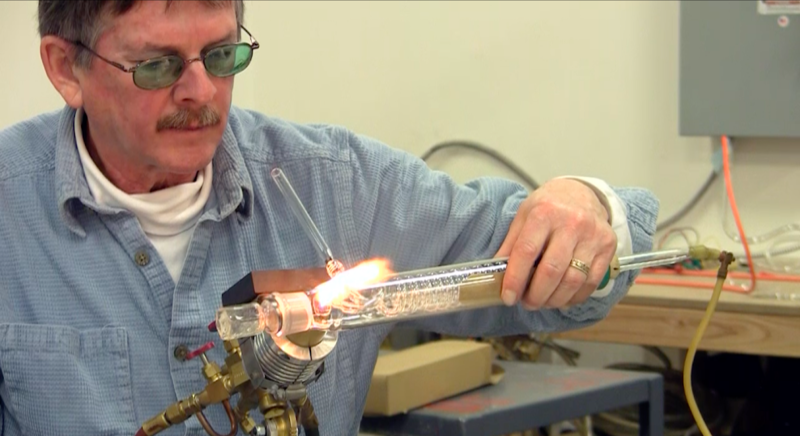 This property makes glass a unique medium to work with for scientists, artists and scientific glassblowers alike. In the video below, we visit a troupe of glassblowers at work at UrbanGlass, an open-access art and glassblowing studio. Video produced by Hanneke Weitering and Lauren J. Young. After living in California all her life, Lauren is thrilled for her many adventures as a SHERPie in New York City. Lauren majored in Biology and minored in English at California Polytechnic State University, San Luis Obispo. Between bug hunting and wielding micropipettes, Lauren created an academic journal for scientists-in-training called Symposium: Student Journal of Science and Math. On the side, she wrote stories about all the amazing resources libraries have to offer for her university library’s blog, Kennedy Out Loud. She has also developed a deep love for traveling, show tunes and strong coffee.